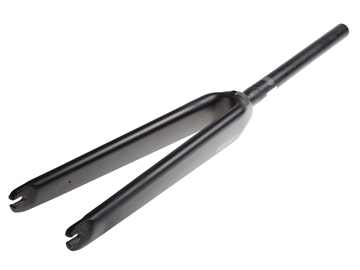 The Aventon Alloy fork is both lightweight, and affordable. Something you rarely find when searching for any bicycle parts. Enjoy the lightweight 6061 alloy with its 28c tire clearance. Whether you're dodging cars on the daily commute or hitting a hair pin in a brakeless crit, this fork is ready for whatever you have to throw at it. 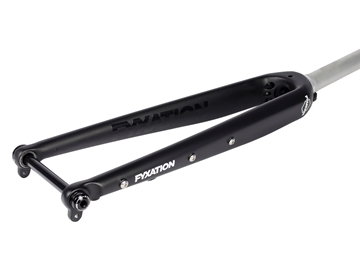 Lite the streets up with this carbon fork made to handle the daily abuse of the city riding. 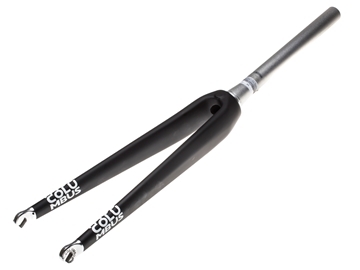 Carbon blades with a 3K weave keep your ride smooth over bumpy roads, while it’s alloy steer tube means you can count on it’s durability for those unexpected pot holes. The Ultimate fork is Aventon's response to the fixed gear rider who demands nothing less then absolute performance. 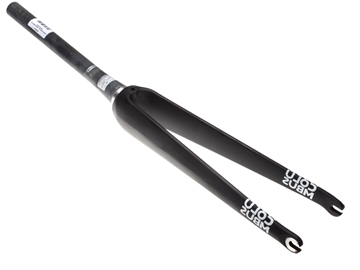 High end Toray carbon with a UD weave keeps the fork feather-light and durable, while it's 35mm rake gives it a responsive ride. Whether you're dodging cars on the daily commute or hitting a hair pin in a brakeless crit, this fork is the Ultimate answer. With its aerodynamic blade profile, reducing drag, the AF01 offers a highly responsive ride. 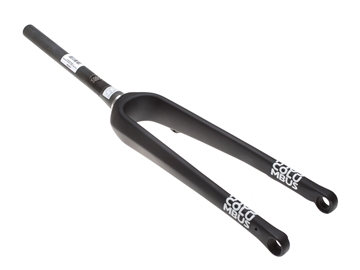 Featuring an integrated carbon crown; this is instead of an aluminium crown race, providing a perfect snap fit with minimum gap between fork and headtube. 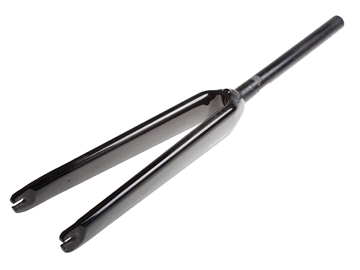 In need of a 30mm rake fork for those tight track builds? 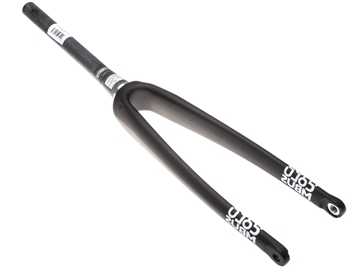 BLB B30 fork is what you're looking for! Carbon straight blade profile with alloy steerer and finished in a matt black - you can't go wrong! 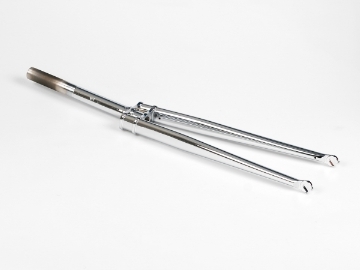 Strong and extremely elegant this fork alludes to a rich history of double crown forks with an up to the minute look. 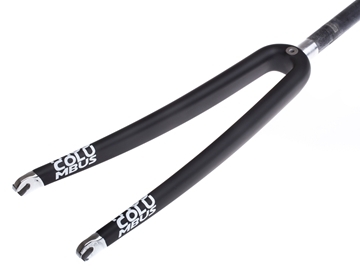 Designed for time-trial or triathlon frames. It uses an aerodynamic bladed profile made from variable section carbon fibre to reduce drag. 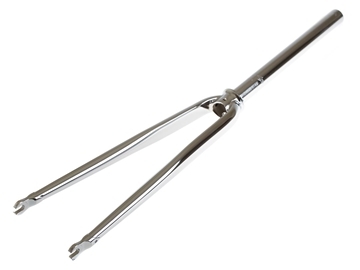 The fork blades also have a special curve in the rear section to improve handling comfort. 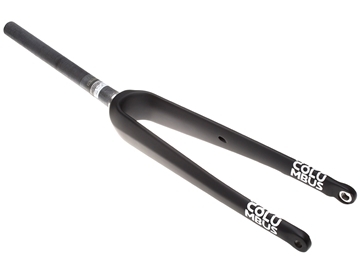 An absolute essential for any bike with a carbon steerer tube. 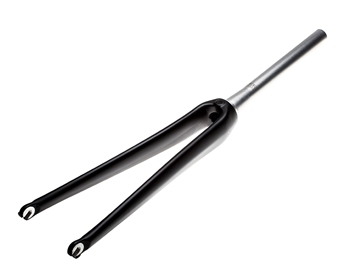 A carbon Fork Bung is an expander plug that tightens into the top of the steerer tube to give the headset top cap something to pull on when compressing the headset. Combining its streamlined front section, curvilinear blades and oversized sections and shapes, the Futura delivers an extremely sharp riding experience with an excellent overall weight reduction and enhanced stiffness and precision when cornering. A Columbus icon at the peak of carbon technology, the Futura SL was designed with control and reliability at its core. Lightweight tapered blades and increased tyre clearance (28mm) offer a superior aerodynamic yet well-balanced ride. The special CNC integrated shim reduces vibrations and unnecessary stress on the frame. The family grows and together with the Disc and Gravel models, the Futura Cross model completes the range of disc brake solutions for off-road enthusiast. Optimal stability and powerful braking are supplied through the ability to host up to 180mm rotors and a tapered 1 1/2” steerer. 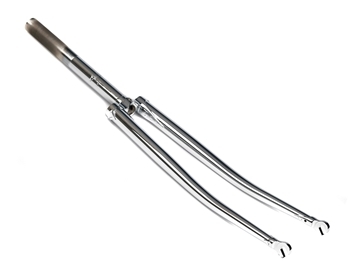 The Futura Cross fork can mount up to 47mm tyres on 700c wheels, but more interesting is the option of mounting 27.5'' wheels with a 2.1'' tyre. Last but not least, the innovative Multi-Rake system provides frame designers with more freedom to design when it comes to geometry and trail, and an adjustable set-up based on use and choice of tires ensures riders will find the perfect fit. The Futura Disc’s ultra-light monocoque structure has been asymmetrically reinforced in the areas most stressed when braking, as well as providing increased torsion control. Twinned with the capability of mounting 160mm disc rotors and an 1.5” oversized steerer to maximise stiffness, the Futura Disc ensures an unbeatable performance. Whether on or off-road, dry or wet, the Futura Gravel can face the most demanding conditions. Optimal stability and powerful braking are supplied through the ability to host up to 160mm rotors and a tapered 1 1/4” steerer. Oversized clearance allows knobbly tyres up to 40mm whilst integrated hidden eyelets enable the use of fenders (35mm tyre max). 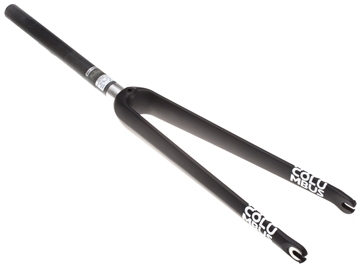 This fork is made with overlapped layers of carbon fibre used in the aeronautical industry. 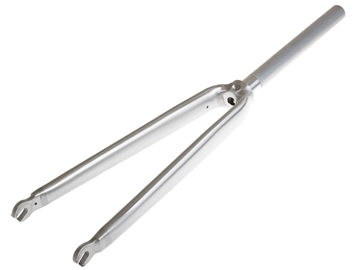 The progressive curve of the fork blades absorbs vibrations and guarantee great handling stability in extreme conditions. The straight blades are laminated using T700 unidirectional carbon fiber. 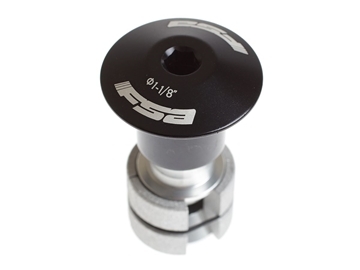 The 1.5" forged aluminium head is CNC machined and presents inside the hole for assembling the front brake (for use without the brake the hole is closed by the cap that can be easily removed using drill). 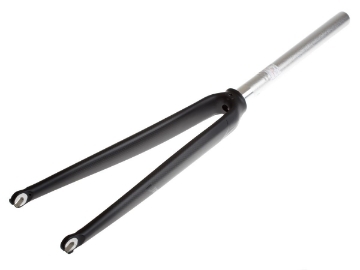 Carbon fibre monocoque fork with straight blades which follow the original design of the Tusk profile. 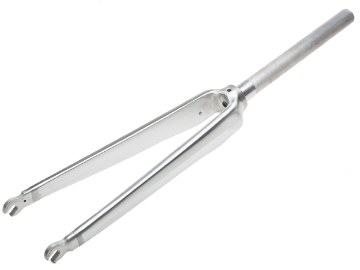 An aluminium insert reinforces the fork head crown to prevent damages from the headset. 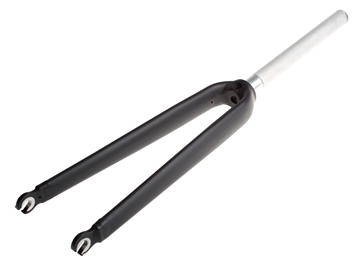 The fork column steerer diameter is 1 1/8" and dropouts are forged in aluminium 6061 T6. 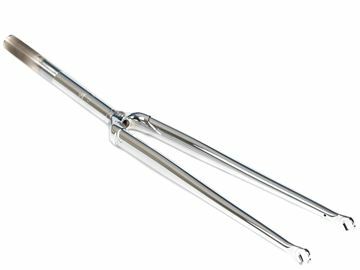 The straight shape of the fork blades increases the stiffness of the fork and gives a better overall driving precision to the bike.